CrowdGauge is an open-source framework for creating educational online games. It first asks users to rank a set of priorities, then demonstrates how a series of actions and policies might impact those priorities. The third part of the sequence gives users a limited number of coins, asking them to put that money towards the actions they support most. 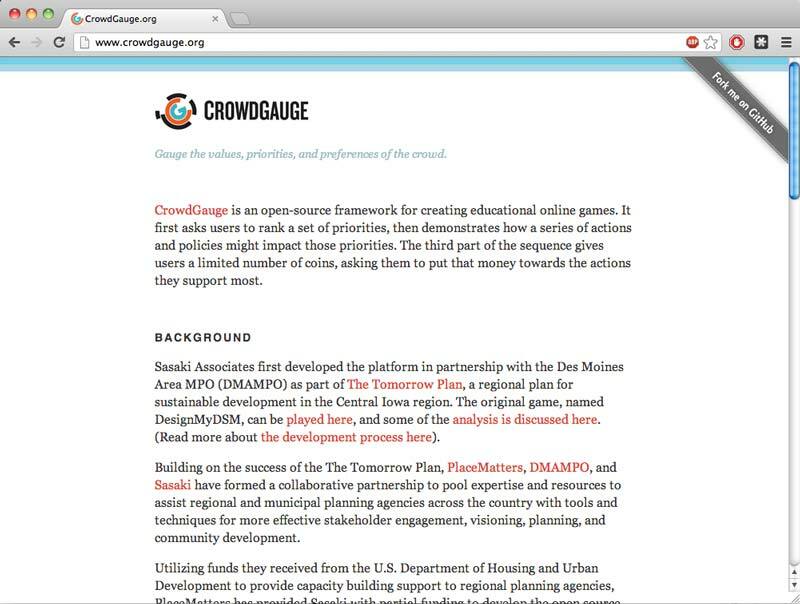 CrowdGauge was developed based on the concept and framework of DesignMyDSM, which was originally developed as part of The Tomorrow Plan of Greater Des Moines, Iowa. Read more about DesignMyDSM here. I managed the content development and lead the UX, UI, and visual design of the initial DesignMyDSM prototype. After that launch, we partnered with PlaceMatters to create a new open source framework that we named CrowdGauge. As a fun side project to managing that development process, I also designed a new logo identity and simple website for CrowdGauge. 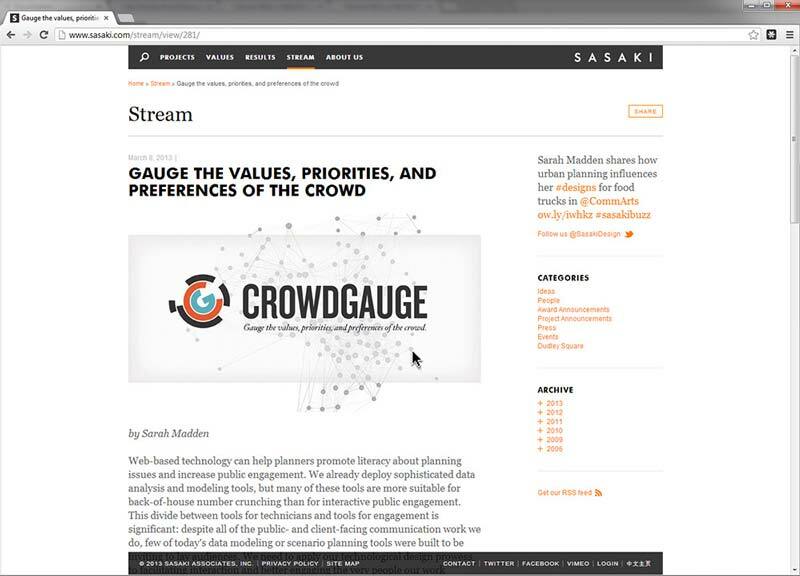 I wrote an article about CrowdGauge for the American Planning Association's Planning and Technology Today newsletter that was also reposted on sasaki.com. "Web-based technology can help planners promote literacy about planning issues and increase public engagement. We already deploy sophisticated data analysis and modeling tools, but many of these tools are more suitable for back-of-house number crunching than for interactive public engagement. This divide between tools for technicians and tools for engagement is significant: despite all of the public- and client-facing communication work we do, few of today's data modeling or scenario planning tools were built to be inviting to lay audiences. We need to apply our technological design prowess to facilitating interaction and better engaging the very people our work supports. As web-based technologies grow in both functionality and beauty, planners have the opportunity to create new places for people to enjoy expressing ideas, solving problems, and realizing goals. Most importantly for planners, web technologies offer the opportunity to help ask interesting questions and confront tradeoffs. Visual design, information architecture, and usability are increasingly important to match the strength of our technical muscle with the complexity of the human experience—which means designing with clarity and user experience in mind." CrowdGauge is entirely open source and licensed under the permissive MIT license. For more details, see the GitHub repository.